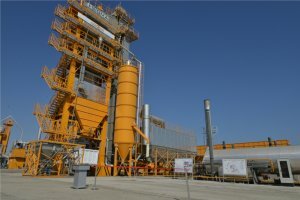 The asphalt plant was commissioned and started up with great success, at the opening ceremony held on August 29th, 2014. Installed at the company’s Balaxani jobsite, the plant has a capacity of 260 tons asphalt production in one hour. The two section storage silos under the plant mixer are capable of storing 85 tons of hot-mix ready to be shipped. The plant is fully automatic controlled by a central computer located inside the control cabin. The customer is one of the leading construction companies of Azerbaijan, having four more older and smaller capacity asphalt plants. SIGMA is purchased by the company as a higher capacity and modern plant fully computer controlled. The plant is also equipped with two 50 m3 capacity thermal oil heated polymer modified bitumen tanks with agitators.